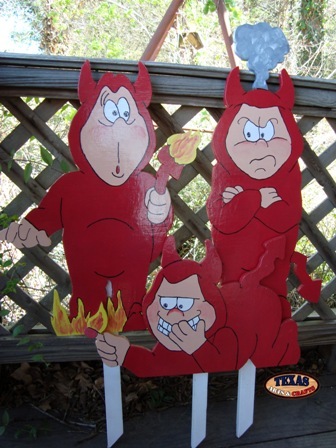 The Three Little Devils consists of the Devil On Fire, the Naughty Devil, and the Smoking Devil. The set is built in our workshop. The devils are all hand painted red. The dimensions for the Devil On Fire are 22 inches tall by 17.50 inches wide by 2 inches deep. 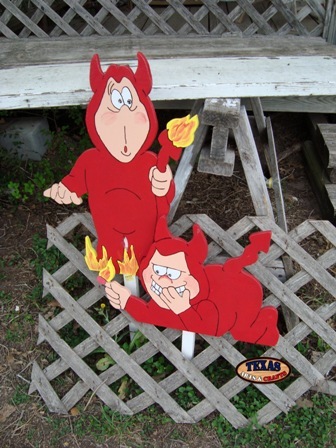 The dimensions for the Naughty Devil are 22 inches tall by 17.50 inches wide by 2 inches deep. 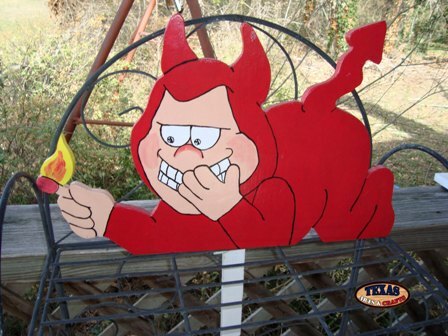 The dimensions for the Smoking Devil are 26.50 inches tall by 10.75 inches wide by 2 inches deep. The combined dimensions are 26.50 inches tall by 17.50 inches wide by 8 inches deep. The combined weight with packaging is 9 pounds. For the continental U.S. shipping and handling is included in the listed price. For shipping outside the continental U.S. please contact us through our Contact Us page. The Devil Set consists of the Devil On Fire and the Naughty Devil. The set is built in our workshop. The yard signs are hand painted red with orange fire. 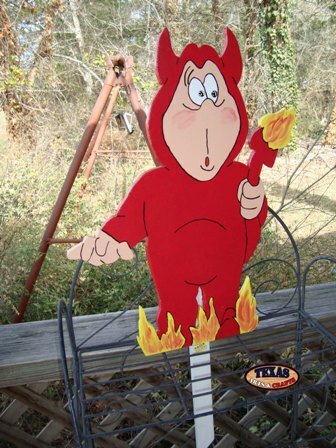 The dimensions for the Devil On Fire are 22 inches tall by 17.50 inches wide by 2 inches deep. 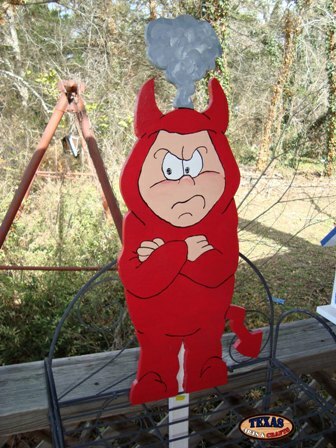 The dimensions for the Naughty Devil are 22 inches tall by 17.50 inches wide by 2 inches deep. The combined dimensions are 22 inches tall by 17.50 inches wide by 4 inches deep. The weight for both items with packaging is 5.50 pounds. For the continental U.S. shipping and handling is included in the listed price. For shipping outside the continental U.S. please contact us through our Contact Us page. The Devil On Fire is built in our workshop. The yard sign is hand painted red with orange fire. The dimensions for the devil are 22 inches tall by 17.50 inches wide by 2 inches deep. The weight with packaging is 3.25 pounds. For the continental U.S. shipping and handling is included in the listed price. For shipping outside the continental U.S. please contact us through our Contact Us page. The Naughty Devil is built in our workshop. The yard art is hand painted red with orange fire. The dimensions for the devil are 22 inches tall by 17.50 inches wide by 2 inches deep. The weight with packaging is 2.25 pounds. For the continental U.S. shipping and handling is included in the listed price. For shipping outside the continental U.S. please contact us through our Contact Us page. The Smoking Devil is built in our workshop. The yard sign is hand painted red with gray smoke. The dimensions for the devil are 26.50 inches tall by 10.75 inches wide by 2 inches deep. The weight with packaging is 3.25 pounds. For the continental U.S. shipping and handling is included in the listed price. For shipping outside the continental U.S. please contact us through our Contact Us page.